Gestern habe ich beim FreePeopleBlog diese witzige Idee gefunden und dachte mir, dass ich das gleich mal nachmache. Allerdings nicht mit meiner Ausgehtasche, sondern mit meinem "täglich Taschenbrot". Was enthält eure Tasche so während des Tages? Yesterday I found this great idea on the FreePeopleBlog and thought I could redo that. But not with my "going out"-bag, but with my daily purse content. My purse contains: wallet, nasal spray (stupid allergy), sanitary article, lipbalm, mobile, hand creme, tissues, earplugs (if there is a spontaneous concert anywhere), anti-histamine (damn you allergy), headache pills. 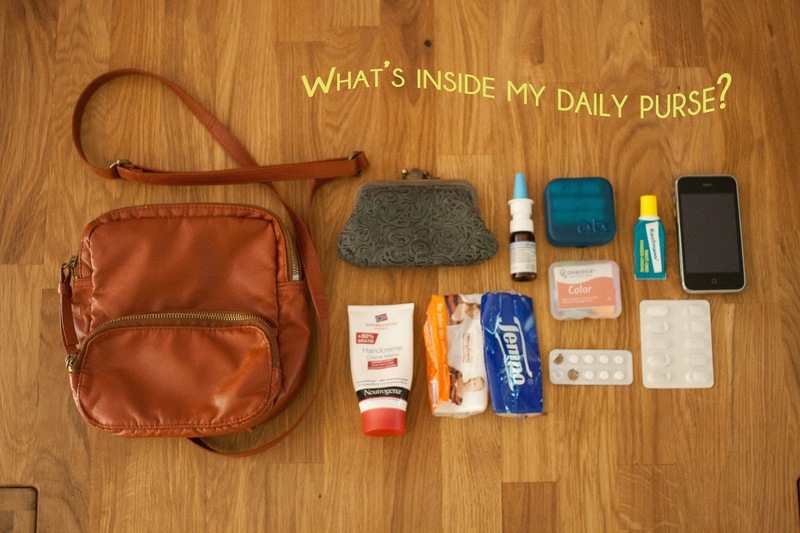 What's in your daily purse?